Why bother with elections? With the collapse of traditional parties around the world and with many pundits predicting a ‘crisis of democracy’, the value of elections as a method for selecting by whom and how we are governed is being questioned. What are the virtues and weaknesses of elections? Are there limitations to what they can realistically achieve? 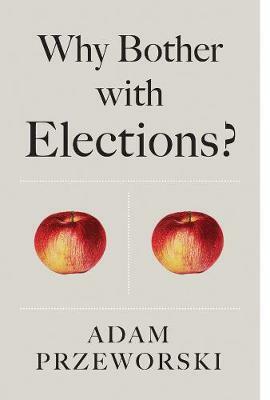 In this deeply-informed and wide-ranging book world-renowned democratic theorist Adam Przeworski offers a warts-and-all analysis of elections and the ways in which they affect our lives. Elections, he argues, are inherently imperfect but they remain the least bad way of choosing our rulers. Even if their imperfections could be addressed, it would be naive to assume they could solve all society’s ills. According to Przeworski, the greatest value of elections, by itself sufficient to cherish them, is that they process whatever conflicts may arise in society in relative liberty and peace. Whether they succeed in doing so in today’s turbulent political climate remains to be seen.